Eyedrops! 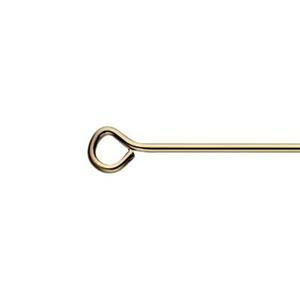 Our GF0242 – 14/20 Yellow Gold-Filled 2-Inch, 24 Gauge, Eyepins! Little Eye Drops for your Jewelry Designs. Just the thing to help you See Clearly when you require Double Duty for your Jewelry Designs: it’s both a Headpin – and an Open Jump Ring in one unique design. Simply open the ring gently, and insert the ring of your Gold-Filled Charm or dangle, gently close – and proceed to wire wrap.